Alexander Girard was born in New York in 1907, grew up in Florence, Italy, received a degree from Rome’s Royal School of Architecture, and subsequently began one of the design field’s most fascinating and exhaustive careers. Little was beyond the realm of this man’s diverse talents, a designer who during his eighty-plus years on earth brought his vision to home exteriors and interiors, factories, offices, museum exhibits, restaurants, furniture, textiles, doors and door handles, lighting and light bulbs, plates, cups, neckties, swizzle sticks, sugar packets, radio cabinets—in essence, anything he felt a need to create. Described by architect Charles Eames as being a bit like a magpie, Girard proved such with his keen-eyed curiosity, resourcefulness, and love of color and whimsy. Contemporary designer Todd Oldham and Kiera Coffee offer a fine tribute to Girard here, following the scope of his early years and career milestones to his general philosophy and work ethic. From his association with furniture manufacturer Herman Miller to his total immersion in projects like Manhattan’s iconic La Fonda del Sol and L’Etoile restaurants, to a three-dimensional, object-based mural conceptualized for John Deere’s corporate headquarters, no detail was forgotten, no nuance ignored. Girard’s revamp of Braniff Airlines’ 1960s image, including Emilio Pucci flight attendant and pilot uniforms, brought about the advertising slogan that the plane was no longer plain and vivified the notion of jetting off for business or pleasure. 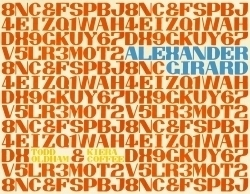 Clearly, Alexander Girard was not just a designer-for-hire, but rather a design genius who delighted in reinventing his clients. Beyond Oldham and Coffee’s “Alexander the Great” as designer are more personal elements, like interviews with Girard’s assistants and his son and grandchildren, and photographs of the charming man himself. Glimpses of meticulous yet playful sketchbooks are also included, as are Girard’s own photos of family and friends, like artist Georgia O’Keeffe, surprisingly prim in a ladylike suit and handbag ensemble. Girard’s passion for folk art and the collection foundation he and his wife, Susan, established are detailed as well—all part of what Todd Oldham describes as the “wonderful, swervy adventure” of discovering the designer’s various facets. The book’s bright layout and lettering are appropriately Girard-inspired, as is the biographical timeline. A must-read for the design-inclined, and an otherwise amazing testament to just how much one colorful person can achieve in a lifetime.